Acne Studios - After declining an invitation to create a collection of costumes for a choreographer friend, Jonny Johannsson decided instead to channel ballet through Acne Studios' SS19 runway show - as echoed by this white shirt. 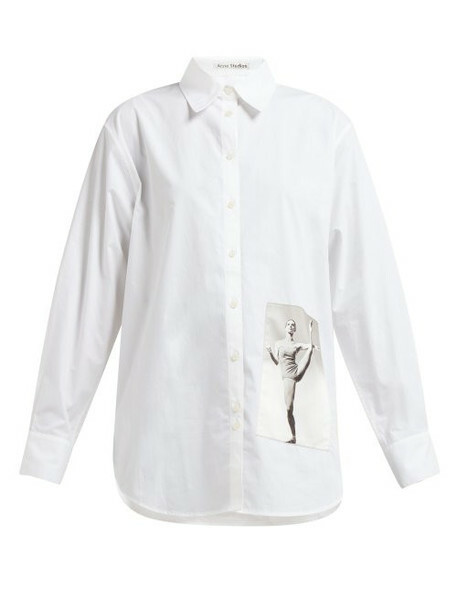 Accented with a black and white image of famed contemporary dancer Carolyn Brown, it's cut from cotton-poplin to a relaxed silhouette and secures with a front button fastening. Style it with tailored separates to heighten the modern mood.